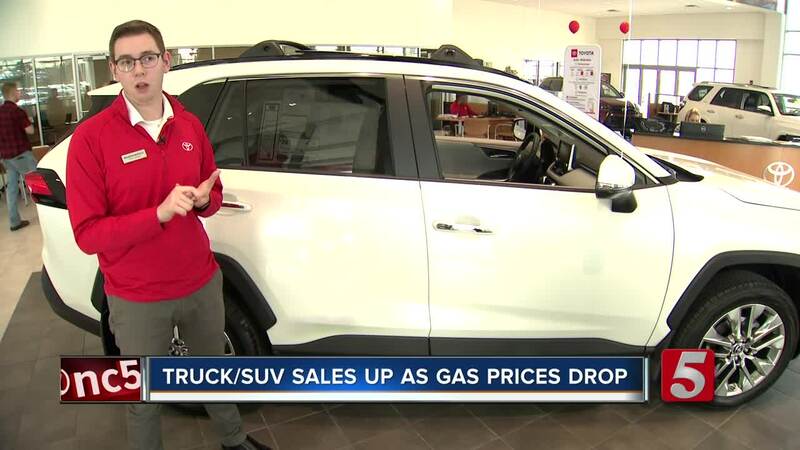 Truck and SUV sales have surpassed smaller car sales as gas prices continue to drop, allowing people to not worry as much about the miles per gallon in cars. NASHVILLE, Tenn. — If you’ve traveled to the gas pump, you’ve surely noticed that gas prices are lower than they’ve been in a long time, and that dip in gas prices has caused an increase in the sales of trucks and SUVs. In the Nashville area, AAA reports that gas prices are at the lowest point they’ve been in 25 months. Meanwhile, many car dealerships saw record numbers in 2018, specifically as the gas prices continued to drop. Marsack said the Camry and Corolla are still some of the most popular cars on the road, but the RAV4, 4Runner, and Tacoma had the biggest increase in sales for them in 2018, all culminating in December. “Last month, we set new sales records for the month, quarter, and year for all three of those models,” Marsack said, adding that the RAV4 was the best-selling car for Toyota in 2018 with 430,000 cars sold. While many may believe Tennesseans are more likely to buy larger cars, it’s actually a national trend. Traditionally, 60% of automobiles sold have been smaller cars, and 40% have been trucks and SUVs, but that trend has switched, thanks in part to the low gas prices, with trucks and SUVs now accounting for 60% of auto sales. While part of the reason is people don’t mind spending a little more at the pump because gas prices are lower, Marsack said it’s also in part to the fact that automakers are making larger cars more fuel efficient. “It’s kind of lessened the gap that they have to worry about in the first place,” Marsack explained. Some automakers have announced that they’ll be phasing out some of their smaller cars in order to focus on their larger vehicles.